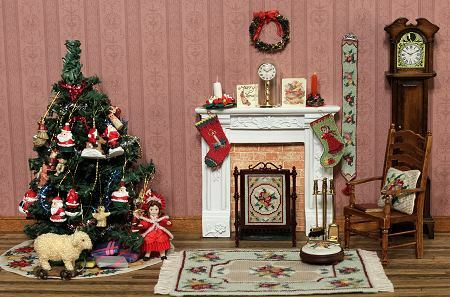 Christmas in July sale of dollhouse needlepoint kits! 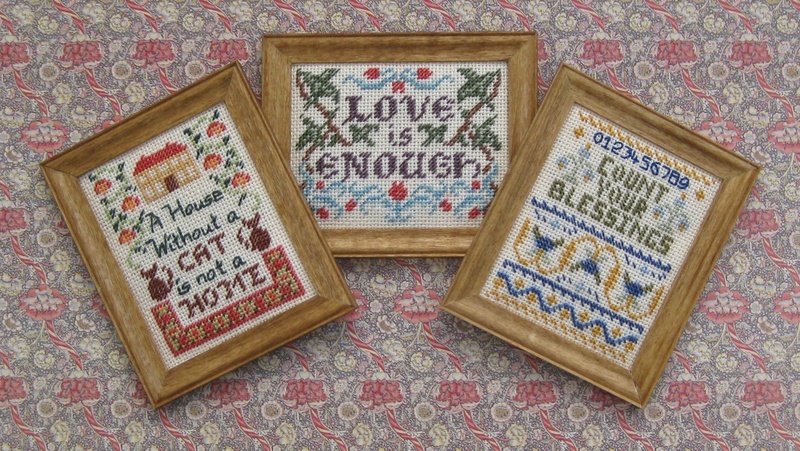 Keen stitchers love to stitch all year round, and if you can add to your stash at bargain prices, that’s even better! 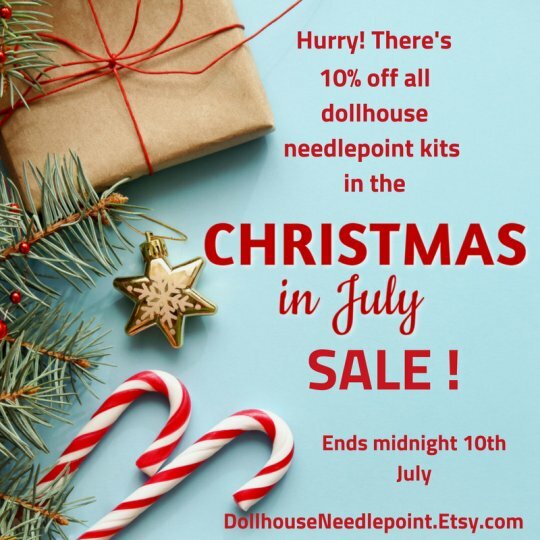 So here’s an insider tip – over on Etsy, there’s a ‘Christmas in July’ promotion going on, where a selection of my best-selling dollhouse needlepoint kits are 10% off until 10th July! 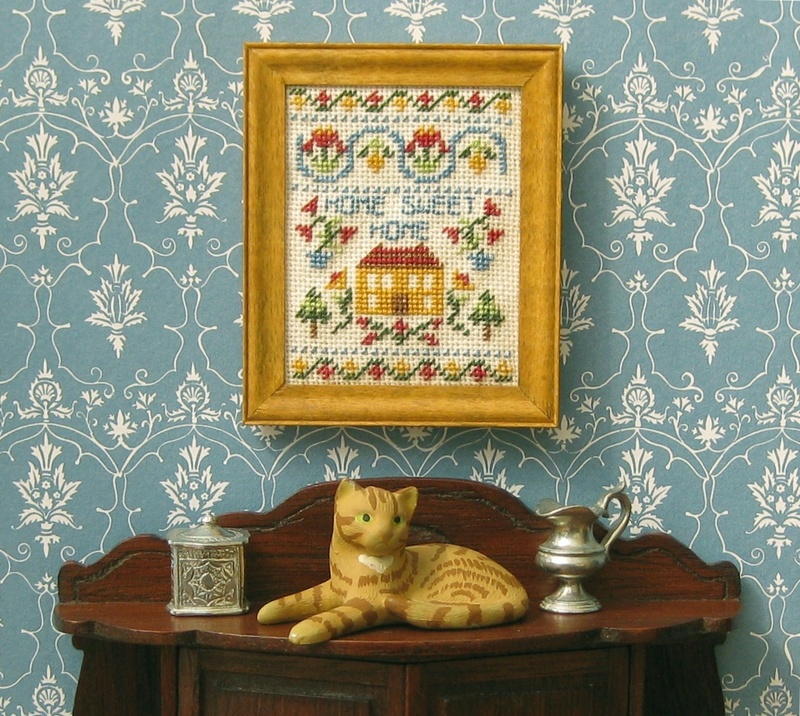 If you’d like to save money on dozens of my best-selling dollhouse needlepoint kits, then head over to my Etsy ‘DollhouseNeedlepoint’ website (this is the website where I feature just my best-sellers, and is not the same thing as my main janetgranger.co.uk website! 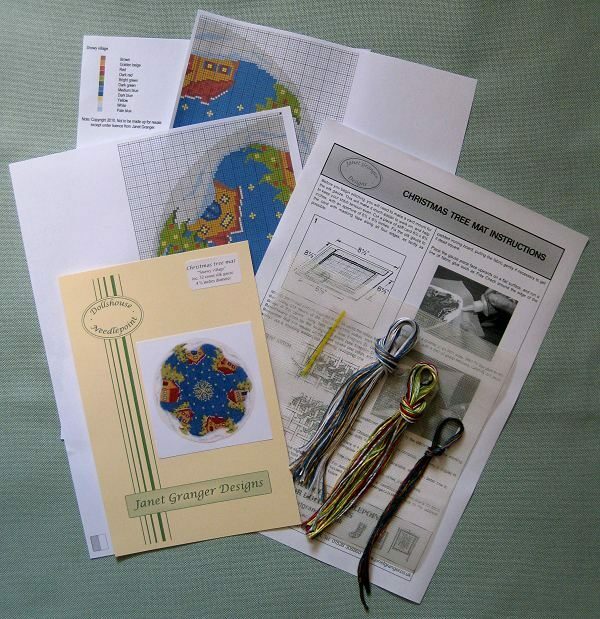 ), where all my kits there are 10% off until midnight on 10th July, as part of Etsy’s ‘Christmas in July’ promotion. 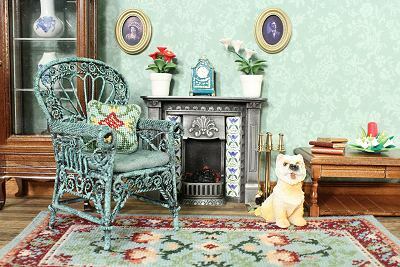 You don’t need any special code or coupon – the discount is automatically deducted. 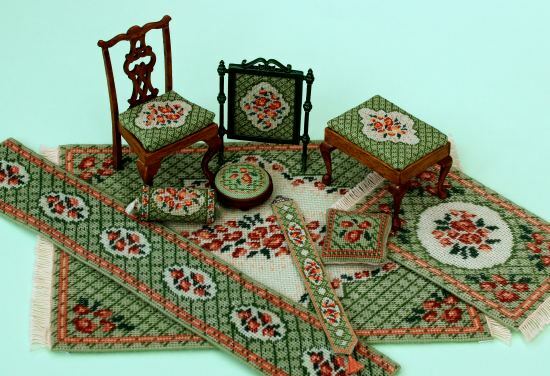 Save on dollhouse scale rug kits, Christmas stocking kits, footstool kits, teacosy kits, and more! 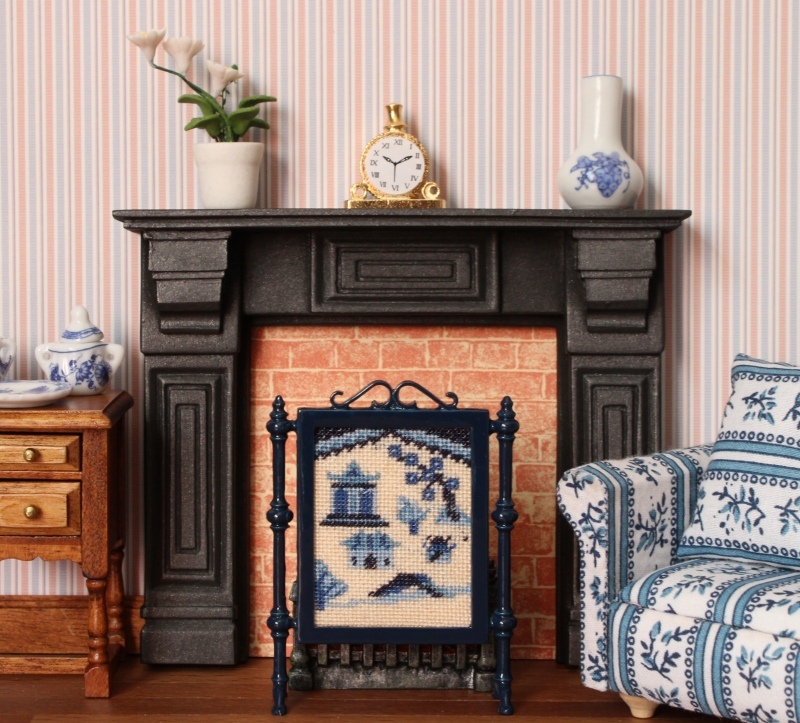 Everything is suitable for 1:12 scale doll’s houses, and there are kits for anyone from beginner to expert. The weather may not be very Christmassy for most of you at the moment (we’ve actually got HOT weather here in the UK, for once! 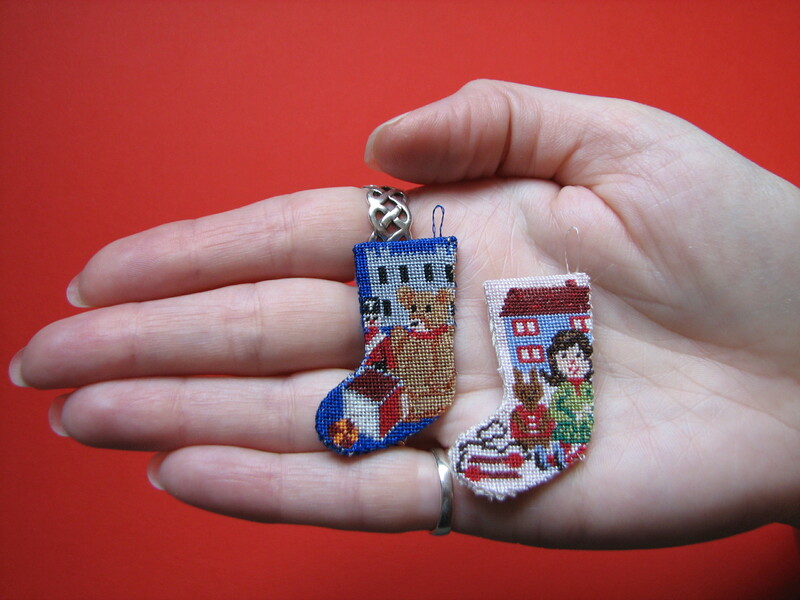 ), but planning your stitching for the winter months is always a good thing, and if you can save money into the bargain, what’s not to like?! 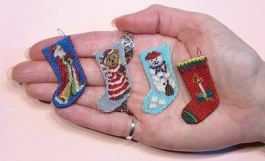 Author Janet GrangerPosted on June 28, 2018 June 25, 2018 Categories Sale itemsTags Christmas in July, Doll's house, Doll's house embroidery, Dollhouse, Embroidery, Etsy, Miniature needlepointLeave a comment on Christmas in July sale of dollhouse needlepoint kits! 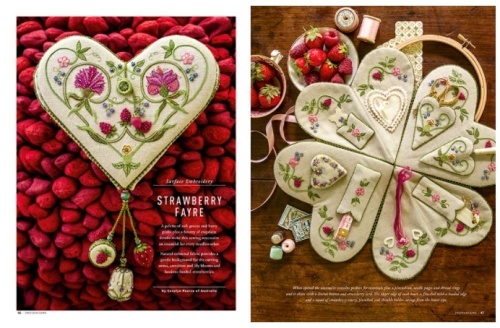 I am currently stitching the Carolyn Pearce Strawberry Fayre heart etui as a stitchalong project. 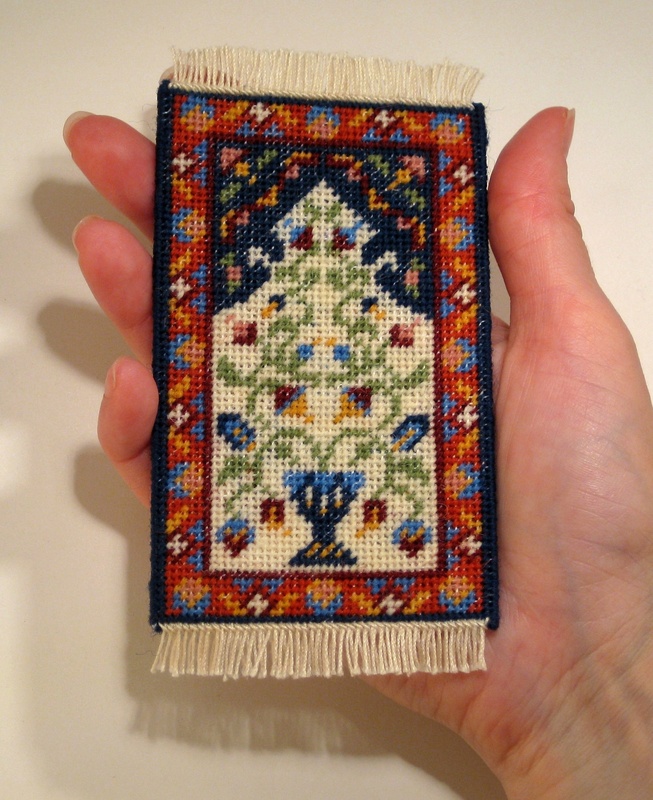 This week, I’ve been stitching the needle pages on doctor flannel. 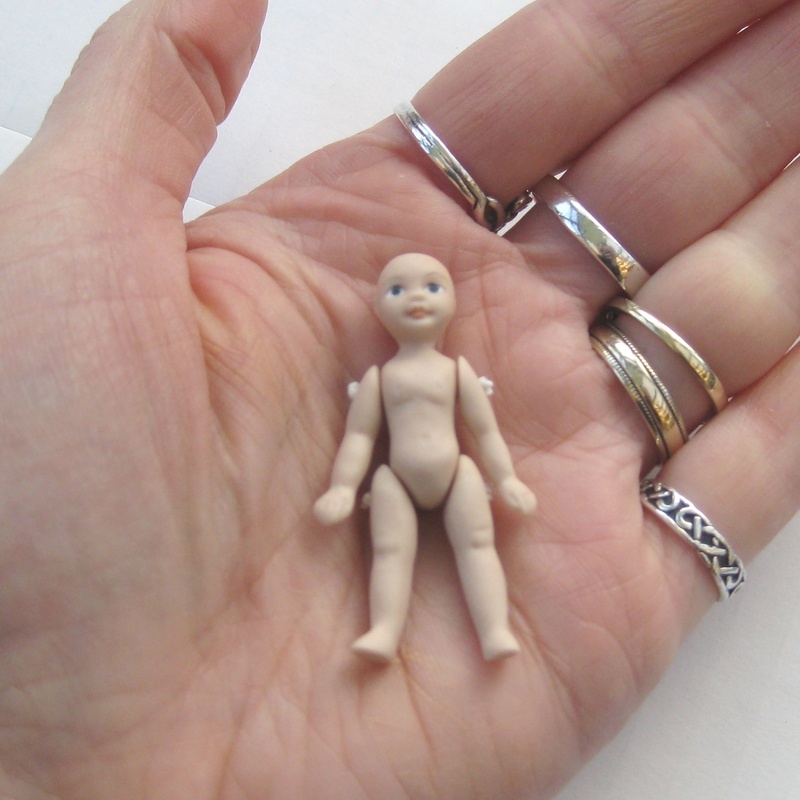 See the end of this post for all the information you’ll need to join in! 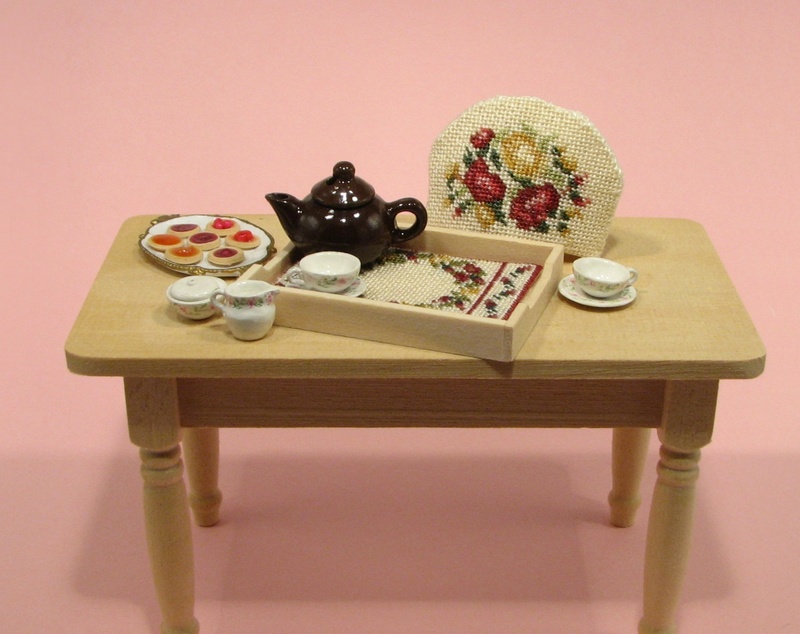 This is the project I’m stitching, as shown in Inspirations magazine issue 95. 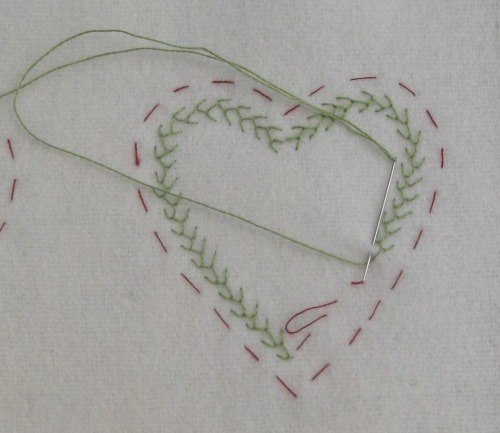 I’m stitching the heart-shaped flannel pieces to be used as a needle holder (it’s on the left of the image below, next to the scissor pocket). 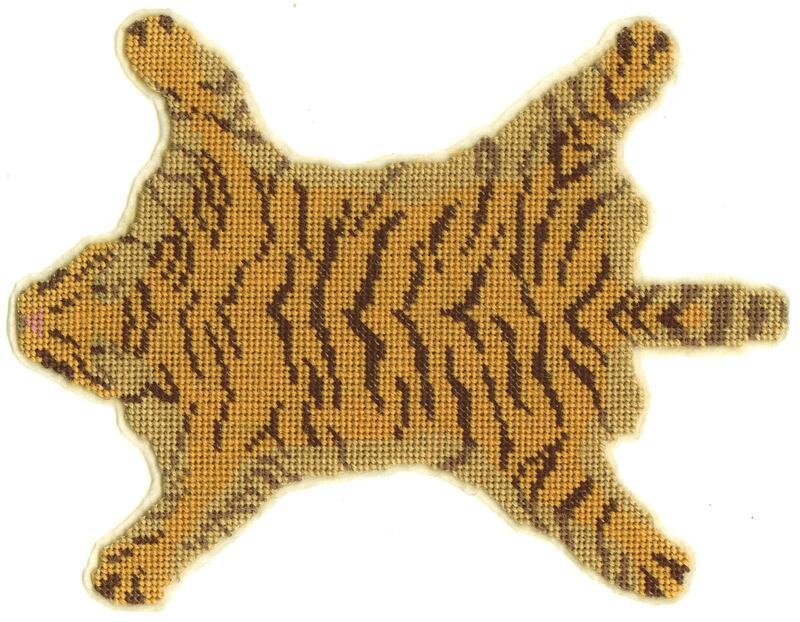 I had a lot of trouble getting ‘real’ doctor flannel. 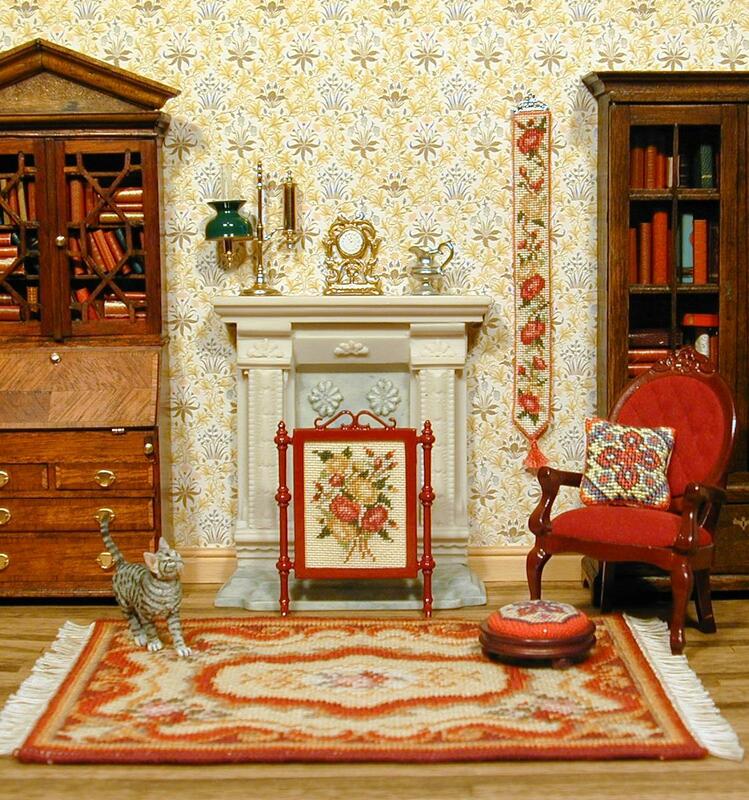 I bought the piece that I’ve used in this project a couple of years ago, from Australia (the shipping to the UK was eye-watering! 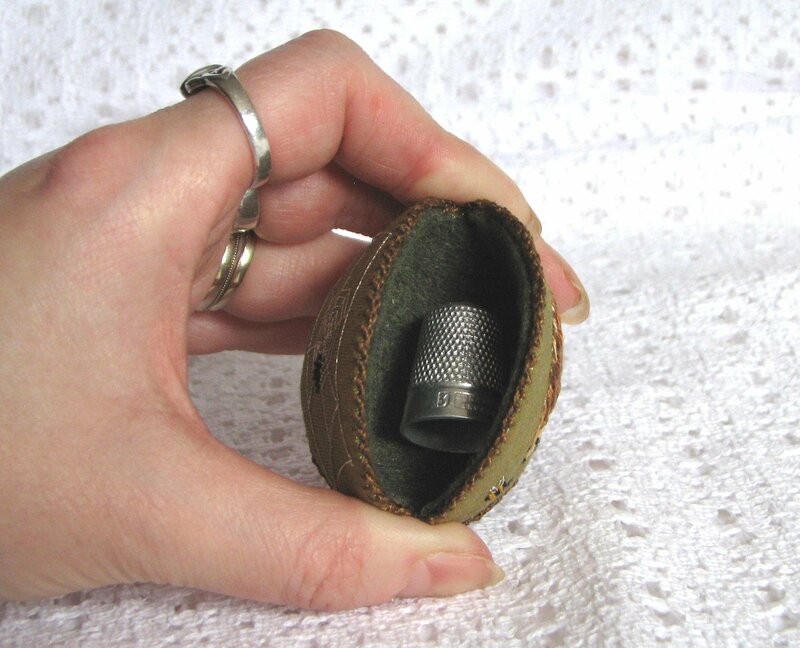 ), as I’d tried to buy it here and had no luck at all – everywhere was sold out. In the end, I contacted an Australian shop, and bought a whole yard of the stuff, which I expect to last me the rest of my life. 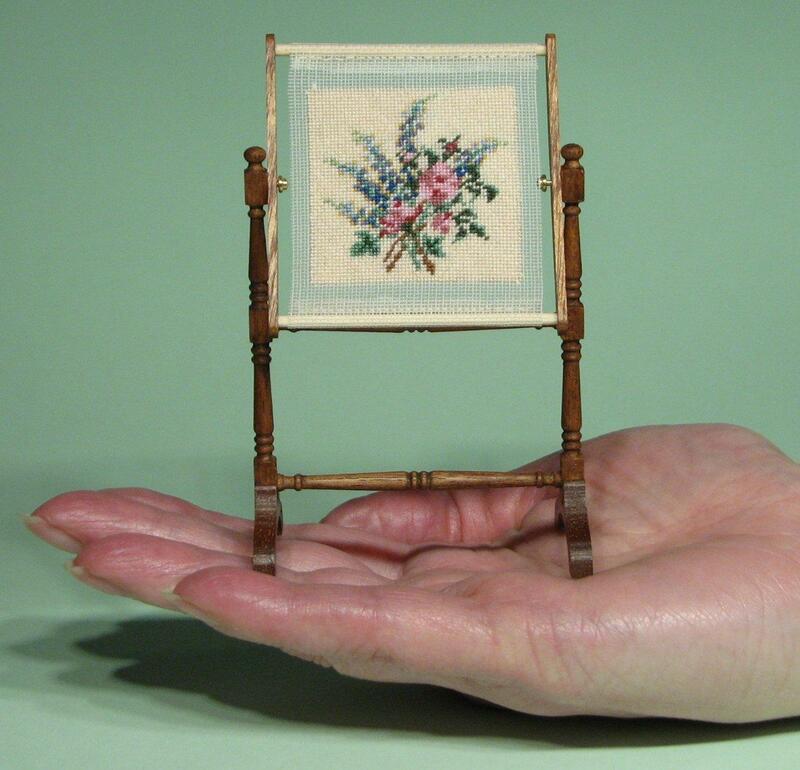 After all, how many needle books can you make, that need doctor flannel for the pages?! 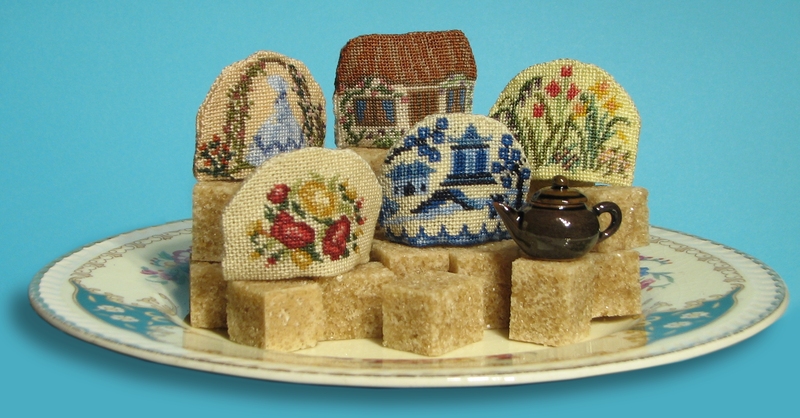 I’ve tried substituting felt before, but it’s just not the same. 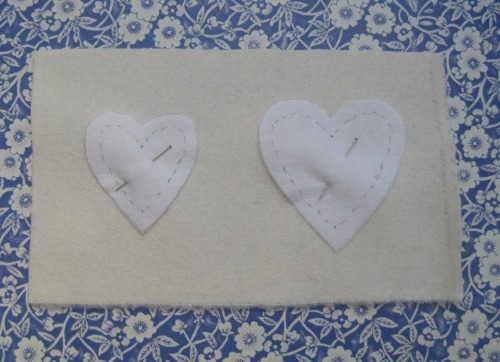 To transfer the shape onto the flannel, I cut out the two different sizes of heart from interfacing, pinned those to the flannel, then tacked around the outside of each shape to transfer the outline. 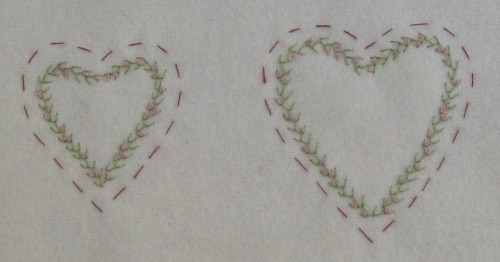 Then I trimmed each heart shape down to the actual stitching line, re-pinned the heart to the flannel and stitched another, smaller heart. 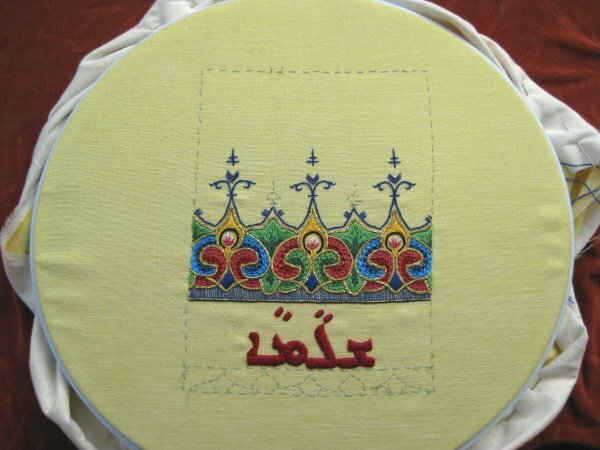 This will be the line that I actually embroider along, unpicking the tacking as I go. 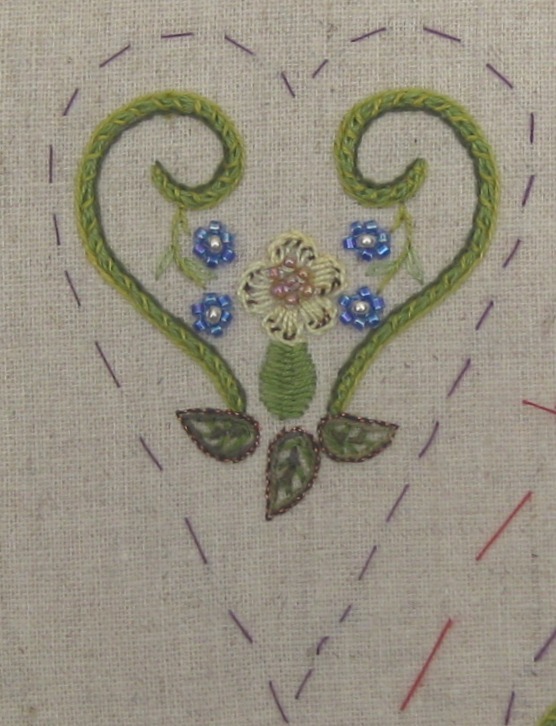 Starting at the top point of the heart, I stitched Fly Stitch down each side, with one strand of Anchor stranded cotton 266 (substitute) ending at the tip each time. 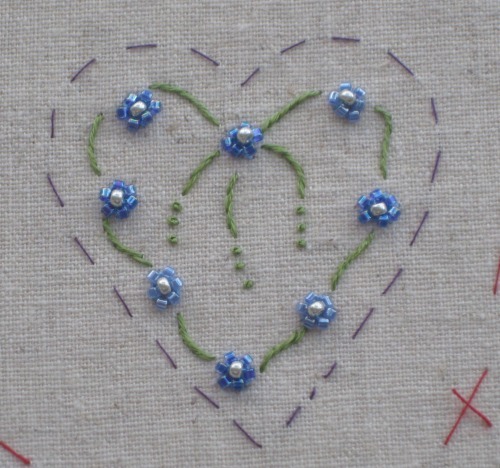 The instructions in the magazine say to stitch a one-wrap French knot into the ‘cup’ of each fly Stitch, using the pink variegated thread. 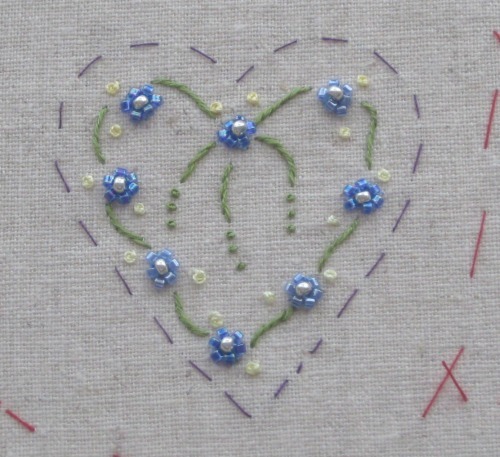 But I’m using two separate shades of Anchor instead – 1028 and 50 – so I had to stitch mine in two ’rounds’, trying to make it look ‘random’. 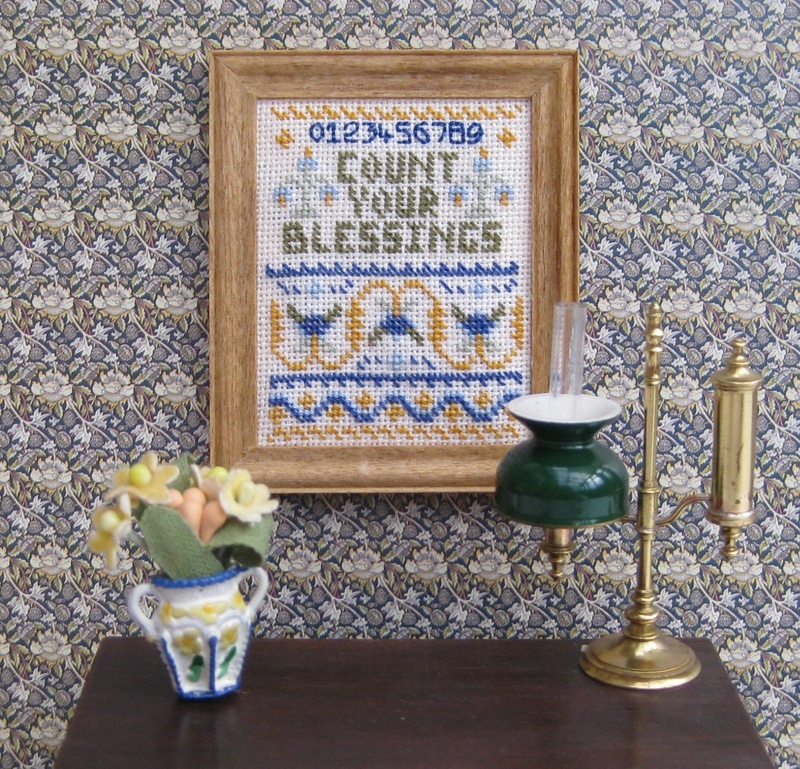 Have you ever had to *decide* on a ‘random’ pattern?! It’s not easy! 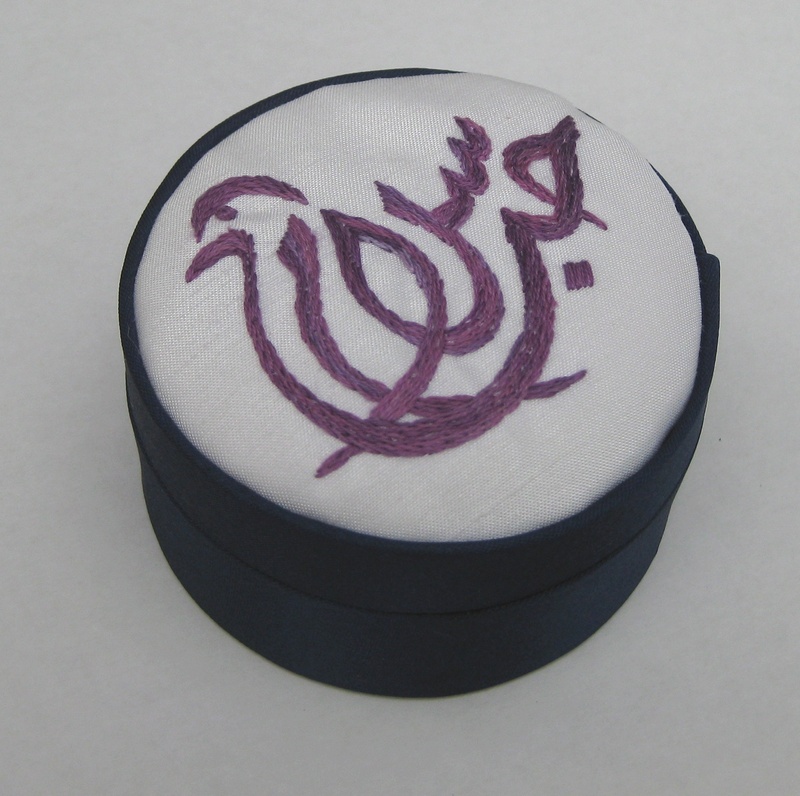 But it came out really well, in the end! 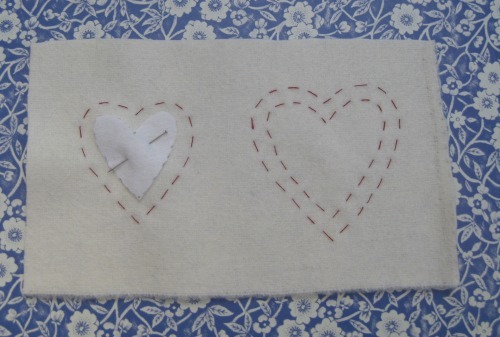 The final, scary, bit, was cutting out each heart shape with pinking shears, and trying to get the points of the triangles to end neatly and evenly at the top and bottom of the heart. 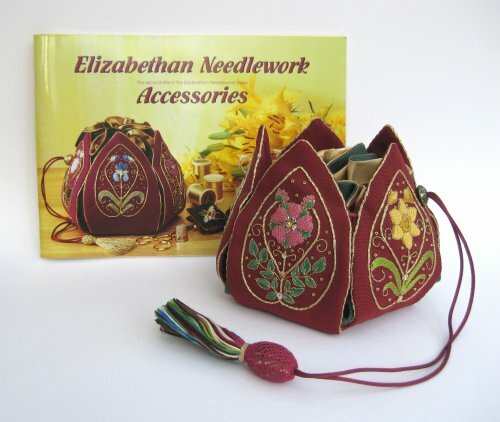 These pages will be secured in the centre with just one little button, when the etui is assembled, so that needles can be attached on both layers. 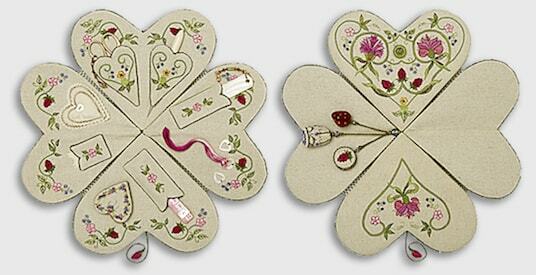 I am currently stitching the Carolyn Pearce Strawberry Fayre heart etui as a stitchalong project. 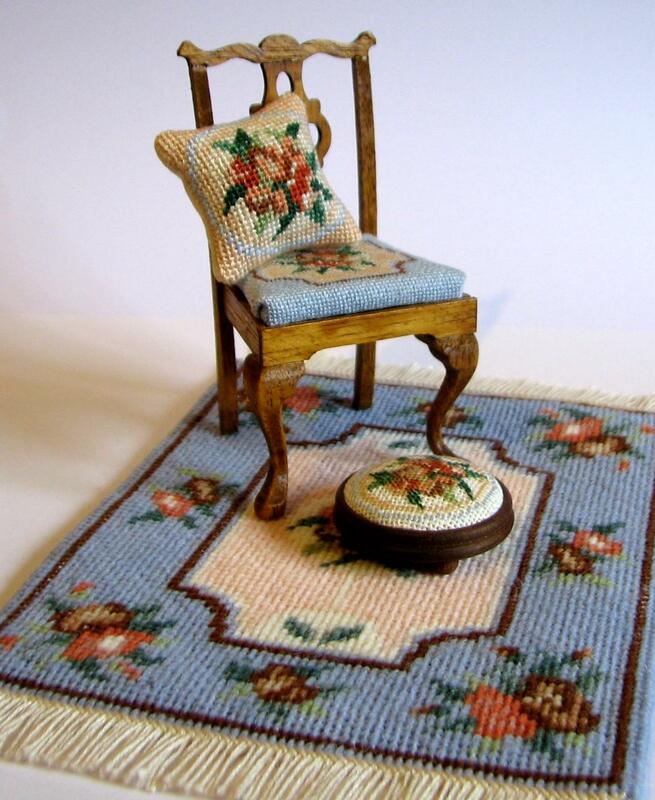 I have been stitching the pincushion top this week. 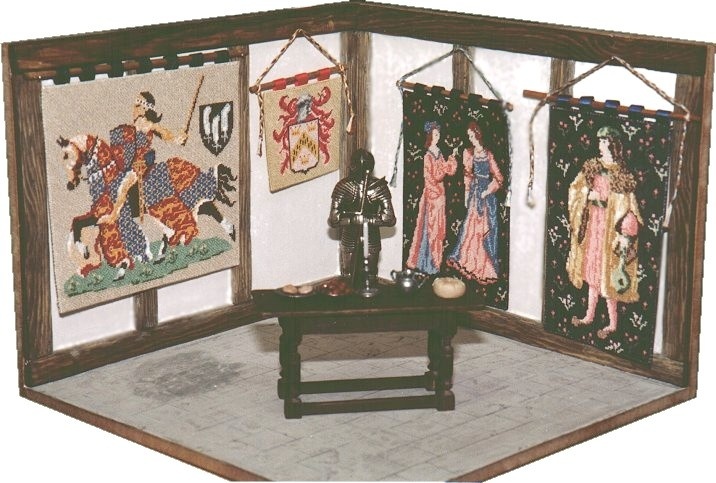 See the end of this post for all the information you’ll need to join in! 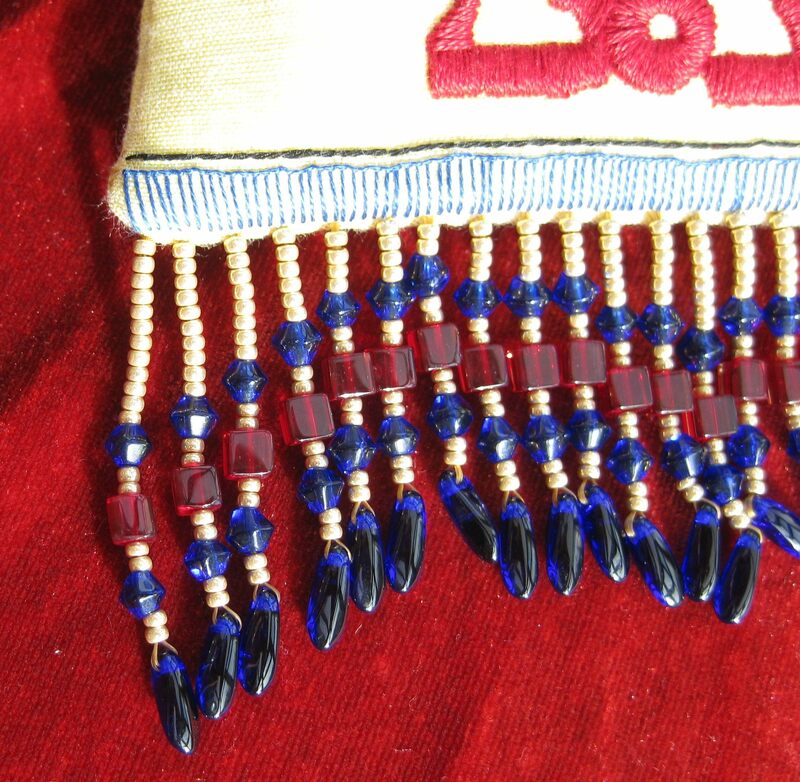 The stems are stitched in Stem Stitch in Anchor stranded cotton 266 (substitute). 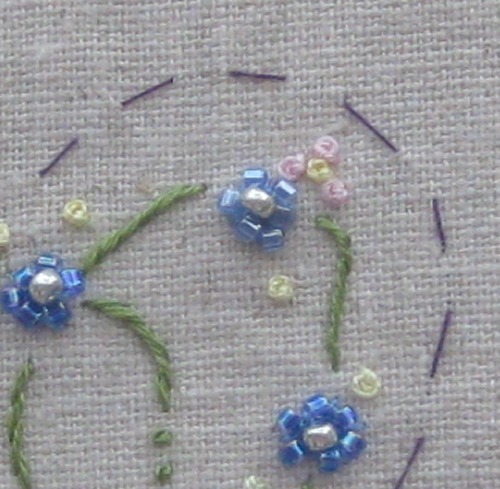 The three trailing stems in the centre on my version are longer than those in the photos in the magazine, as my pencil lines still showed at the ends of the lines where spaced out Colonial knots should have been – but if I’d have stopped as short as those in the photo above, the pencil lines would have been visible, so I extended the lines of Stem Stitch and then put the knots even further out. 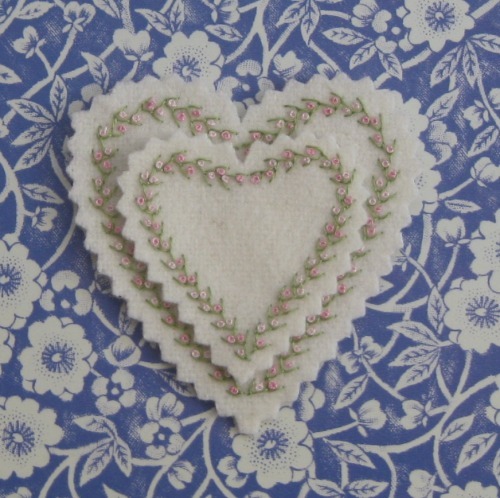 This makes the centre of my pincushion more ‘full’ with stitching, but I like it like that! 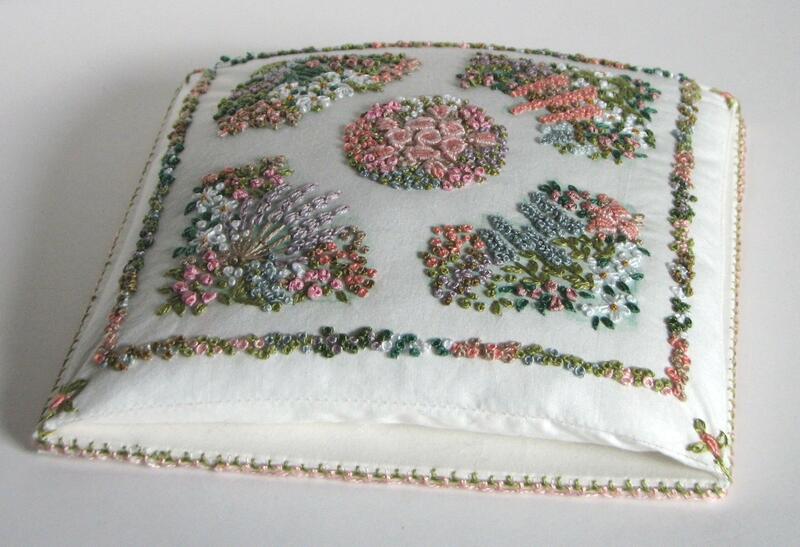 In between the forget-me-nots are little pink flowers. 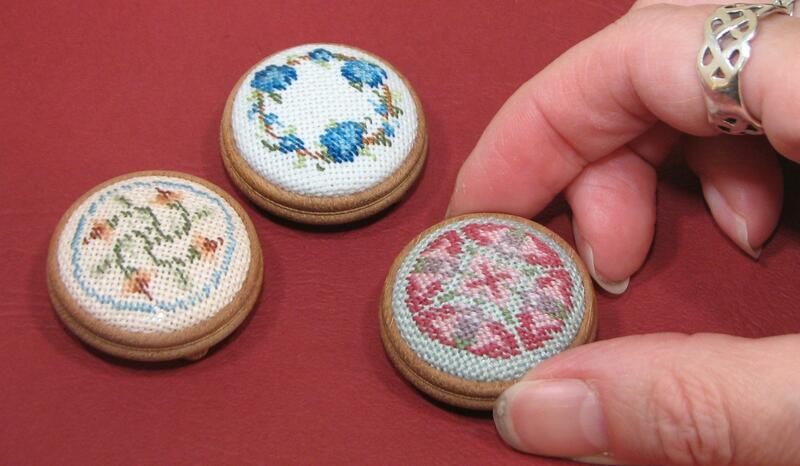 These are made from French knots. 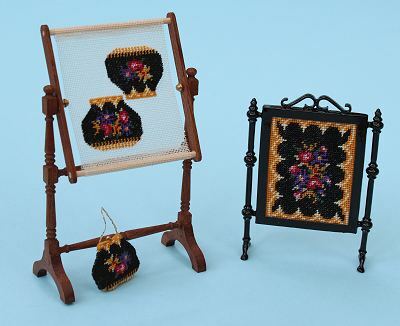 The magazine instructions say to use various light and dark pieces from a variegated thread, but as I’m not using that, I used Anchor stranded cotton in two pink shades – 1028 and 50. 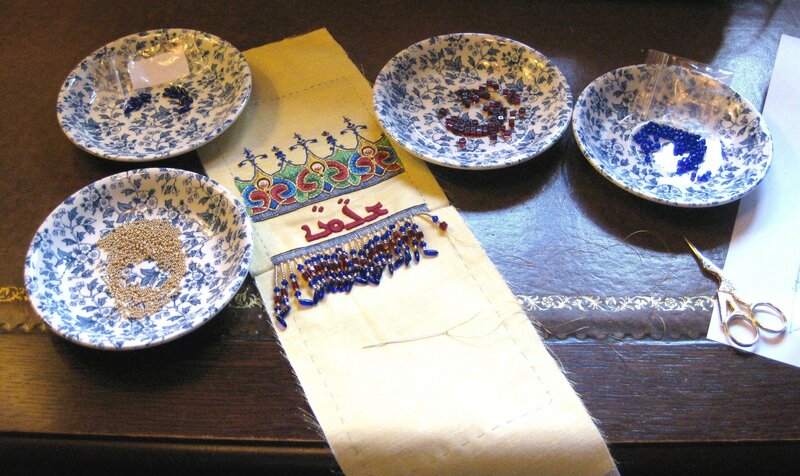 The knots in the centre of each flower were stitched first, using the pale lemon thread from House of Embroidery. 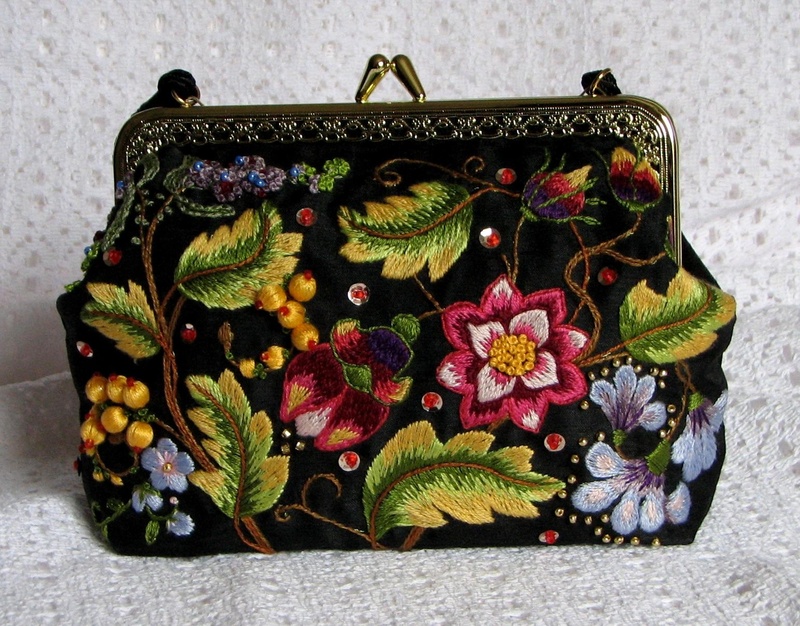 Each beaded flower has two of the French knot flowers placed near to it, but kind of randomly. 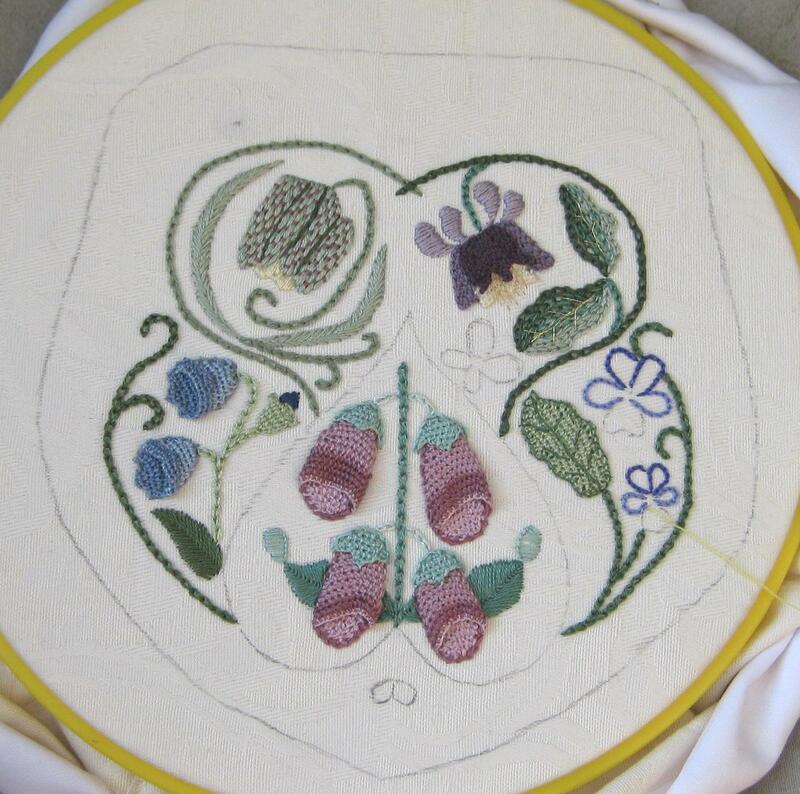 To make the petals for the flowers, I stitched three French knots around the central yellow one, in a vaguely Y-shape, and then filled in with two more to make a circle of knots. 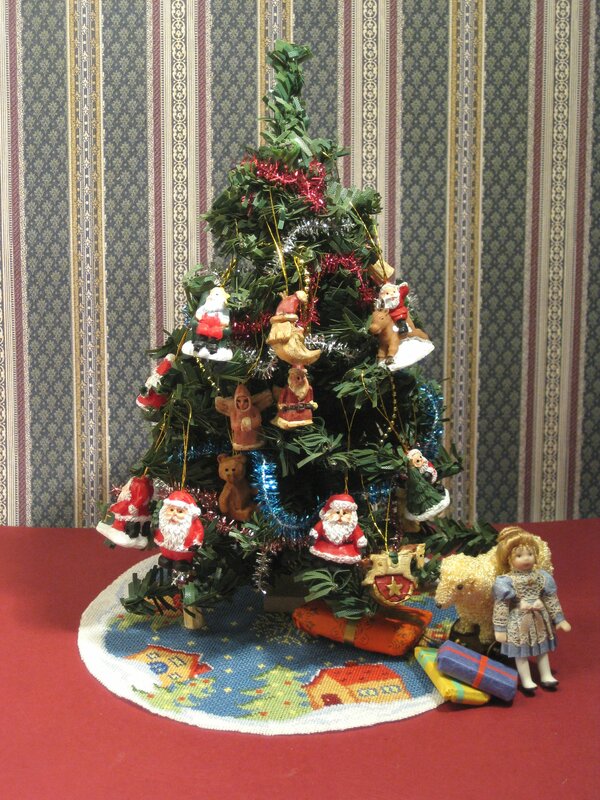 Sort of like this (only this one isn’t actually a good example, but you get the idea!). 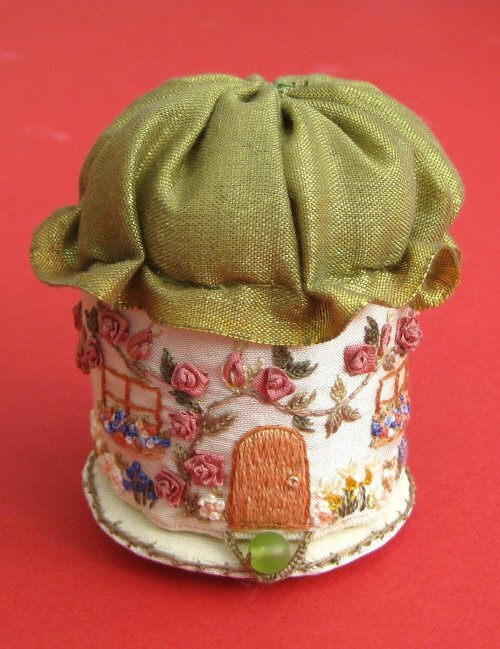 The two tones of pink that I used for the flowers worked really well to make a soft and feminine-looking pincushion. 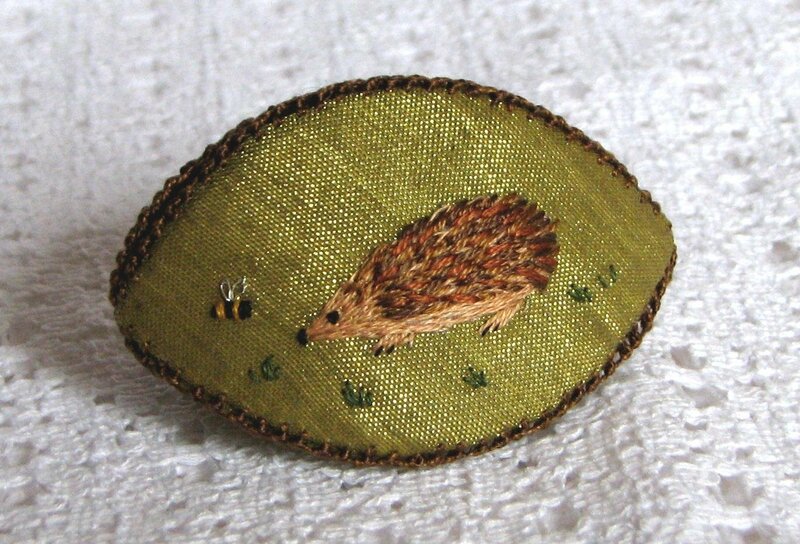 When all the flowers were stitched, I filled in around them with tiny Lazy Daisy leaves, stitched in copper metallic thread and Anchor 267 dark green. 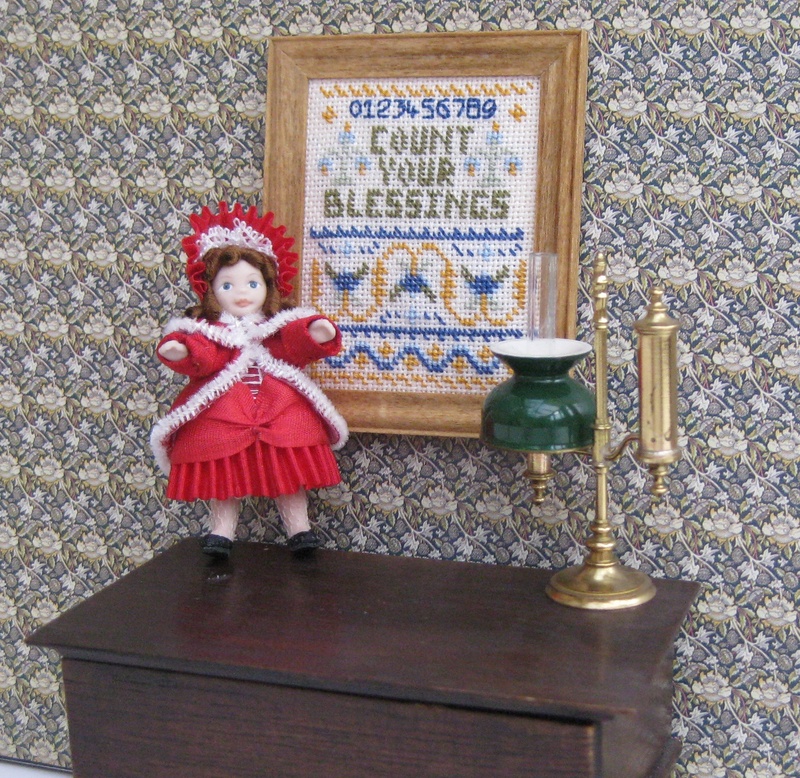 I really enjoyed the randomness of this piece – it appeals to my sense of freedom! 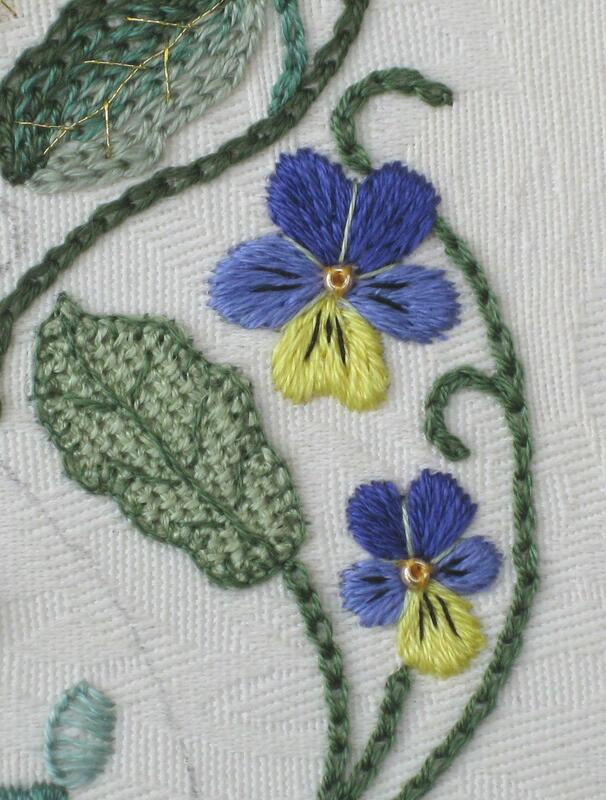 It’s so different to doing the little regimented filling stitches on some of the other bits of this project, like the tiny leaves for the primrose. 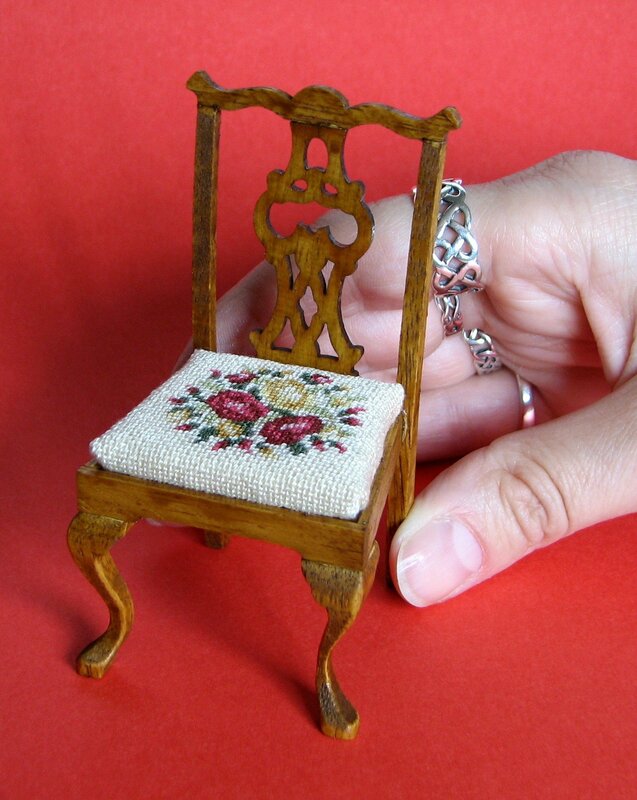 I suspect that those of you stitching along with me will enjoy doing this part, too! 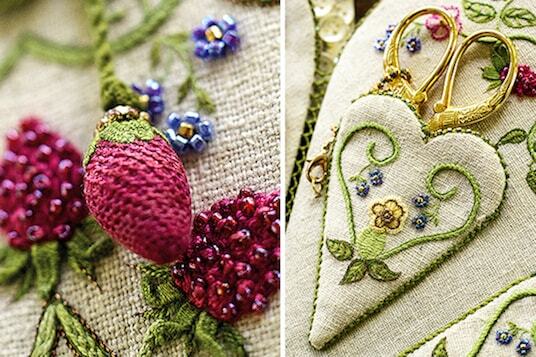 I am currently stitching the Carolyn Pearce Strawberry Fayre heart etui as a stitchalong project. 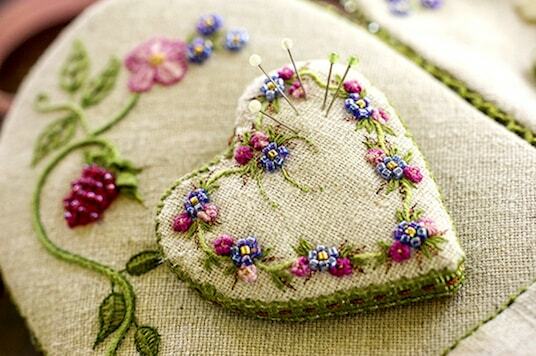 I am now up to the point where I am stitching the heart shaped pockets of the etui. 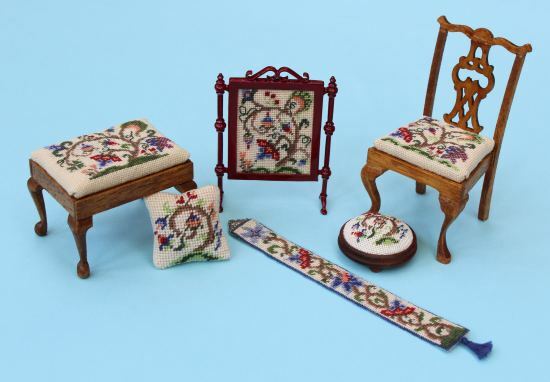 See the end of this post for all the information you’ll need to join in! 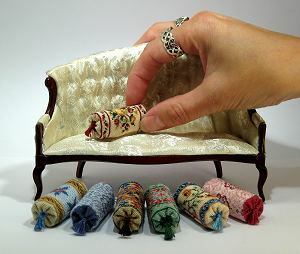 They are stitched using mainly the same stitches and threads as the front of the heart etui, so there isn’t much that’s ‘new’ to stitch on these – in one sense, that could be seen as not so interesting, but at least it means I can do them quicker, as I’m getting much more used to each element now, and how it should be stitched! 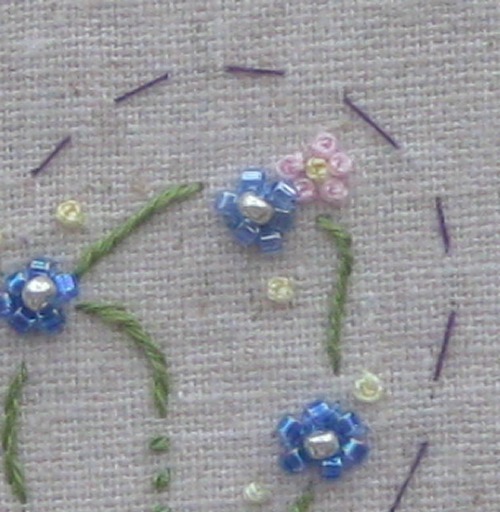 The curving stems are stitched in Chain Stitch using two strands of Anchor stranded cotton 266 (substitute), which is then whipped with one strand of Silk ‘n’ Color Pond Scum (substitute) – remember to always slide the needle from the inner area to the outer edge of the pocket when doing the whipping, so that the direction of your stitches matches on each side. 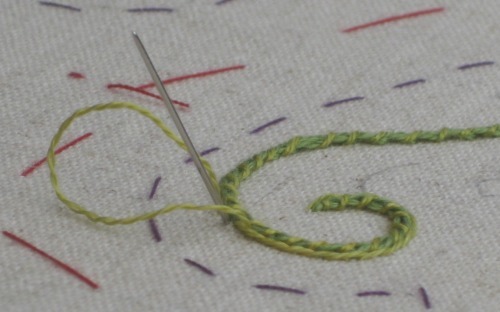 Then work Stem stitch in Anchor 269 (substitute) along the inner edge of the stem, and another line of Stem stitch in Pond Scum round the outer edge. 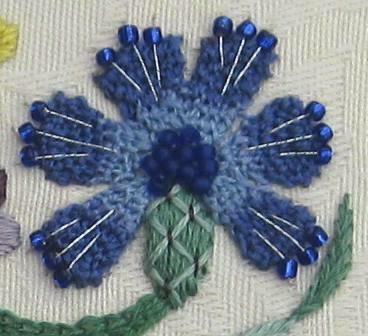 The little stems to the forget-me-nots are also stitched in Stem stitch with one strand of Pond Scum, too. 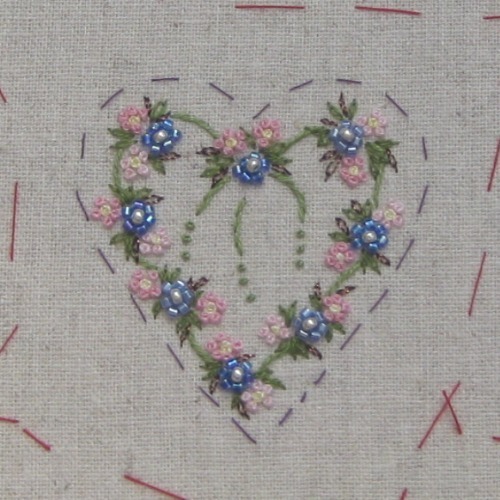 The primrose flower and the forget-me-nots are stitched as on the front of the heart etui (see the blog posts for the front for videos on how to do the different stitches). 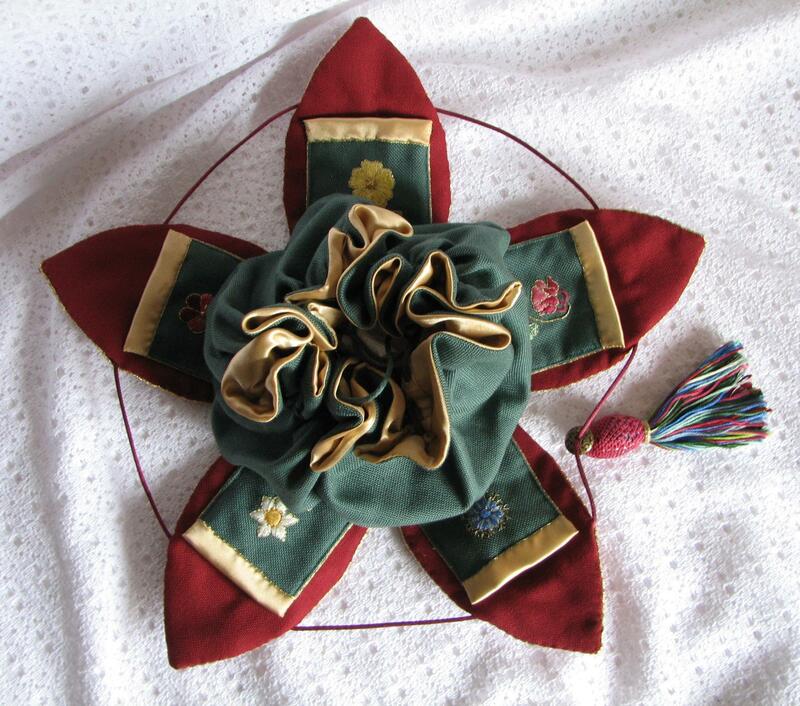 I still adapted the yellow petal stitches, and worked an outer line of Stem stitch to finish the flower, rather than doing what the instructions said (a kind of buttonhole edging stitch), as I didn’t think the magazine’s instructions would work! 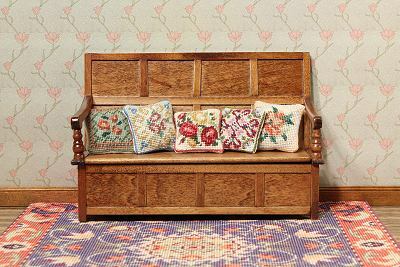 The leaves beneath the primrose are worked in Tied wheatear stitch for the filling, using Anchor 267 and tied with Oliver Twists shade 004, then outlined with more Oliver Twists 004. 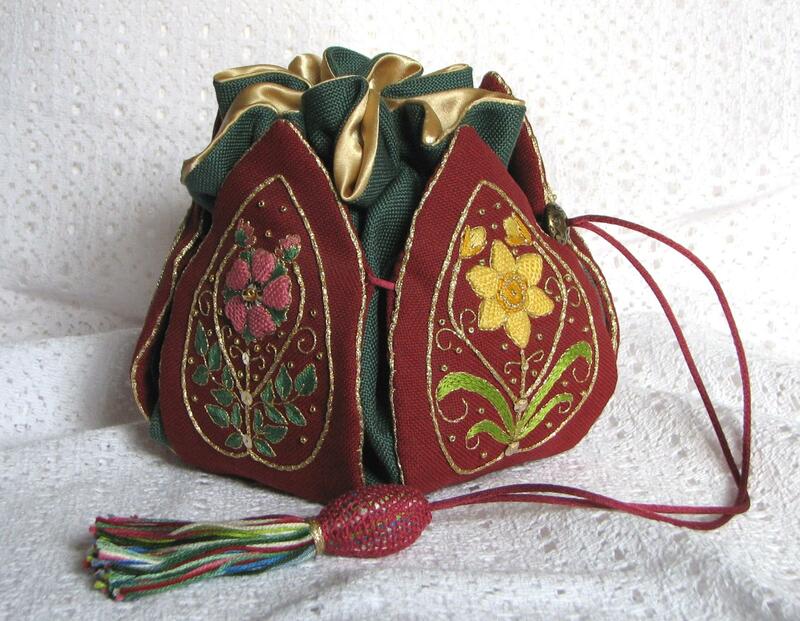 In a slight variation from the leaves on the front of the heart etui, these leaves are then outlined a second time with the fine metallic copper thread. 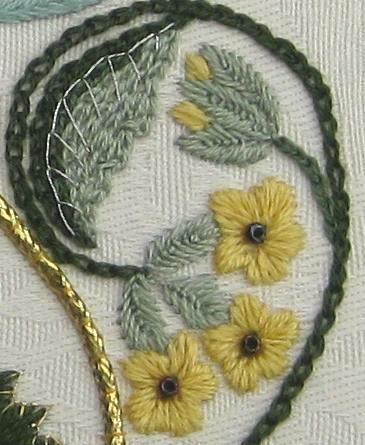 I liked this effect more than without the copper, although it was quite fiddly to do, as these leaves are very small. 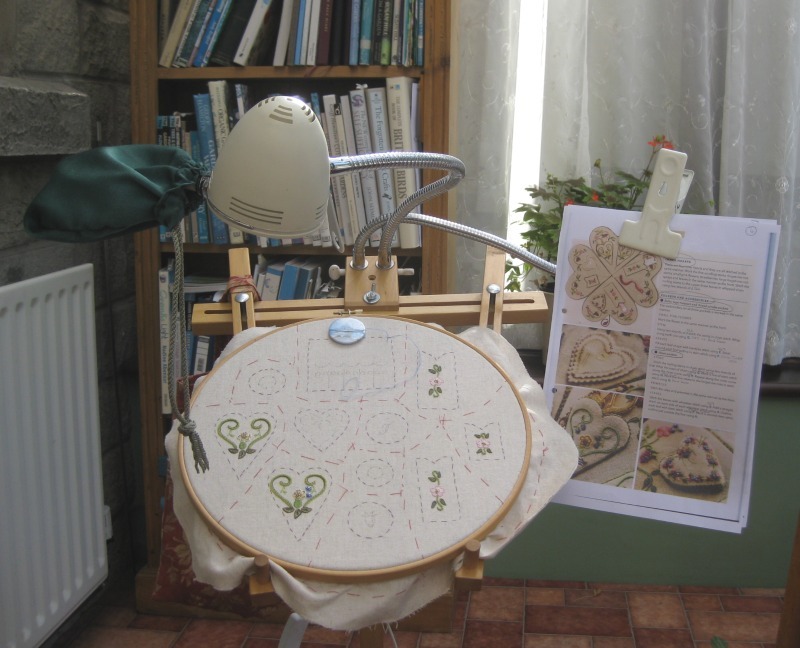 For those of you who have been asking about my stitching set-up for working on this project, I thought I’d show you a quick picture of my floor standing Stitchmaster tapestry frame, which is set up in my conservatory at the moment (now that we have something like summer weather!). 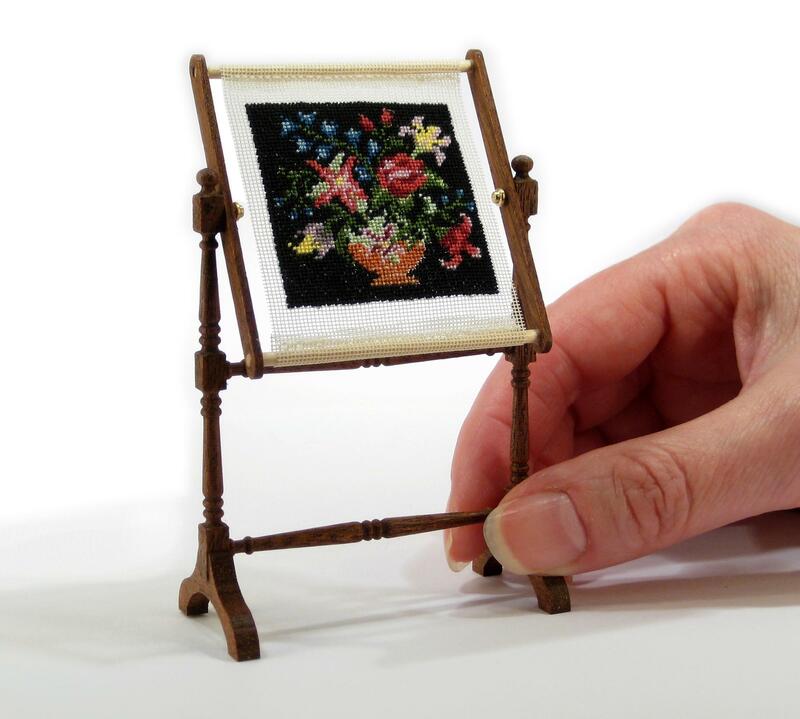 I have to make sure that I cover up the magnifier lens if I leave the frame unattended for even a minute, so that the sun doesn’t shine through it and set my fabric on fire! 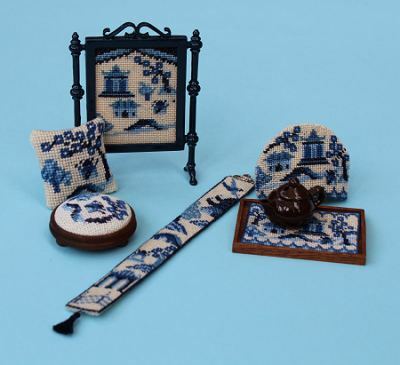 You can see the magnifier, on the left, attached with a ring to the daylight lamp – the lens has a little fabric bag over it with a drawstring top, so that I can quickly cover the lens when I need to. 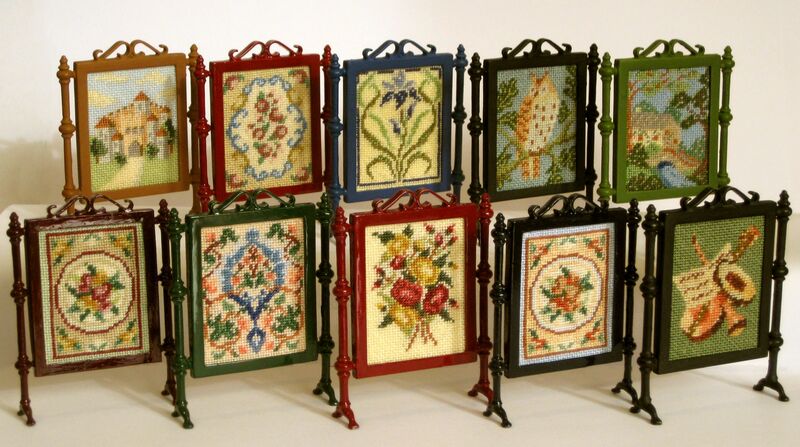 Instead of working from the whole Inspirations magazine issue, I have scanned just the pages for this project, printed them out, and then I clip only the relevant pages to my chart holder. 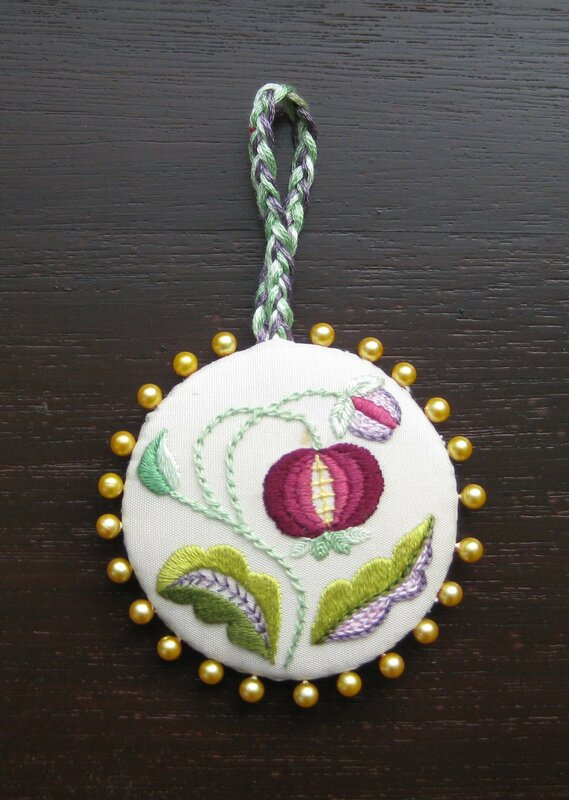 The hoop that holds my fabric is 12 inches diameter, and I find it much more comfortable (and quicker) to stitch several small pieces on one piece of fabric, then cut them apart later. 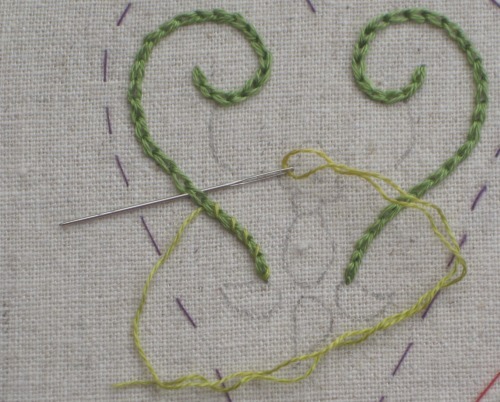 So, my next bit of stitching is the heart near the centre of the hoop – the pincushion!